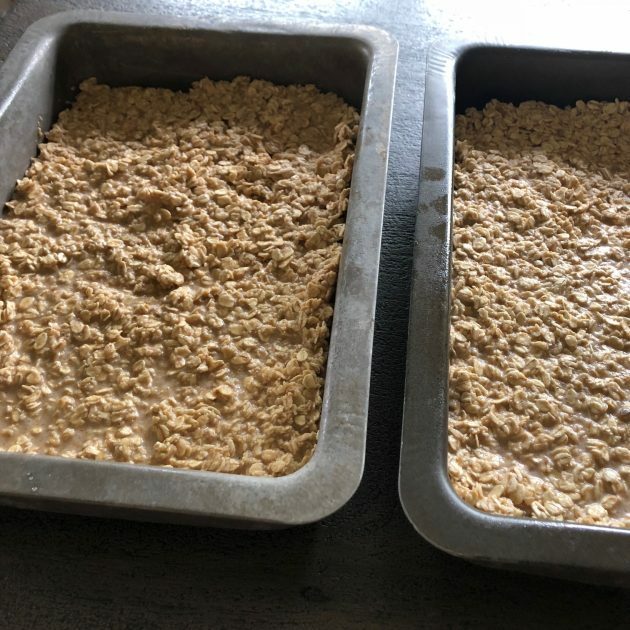 If you’ve been around here for awhile, you know how much we love Baked Oatmeal. My kids would eat it for breakfast every single day! And Jesse loves it, too. 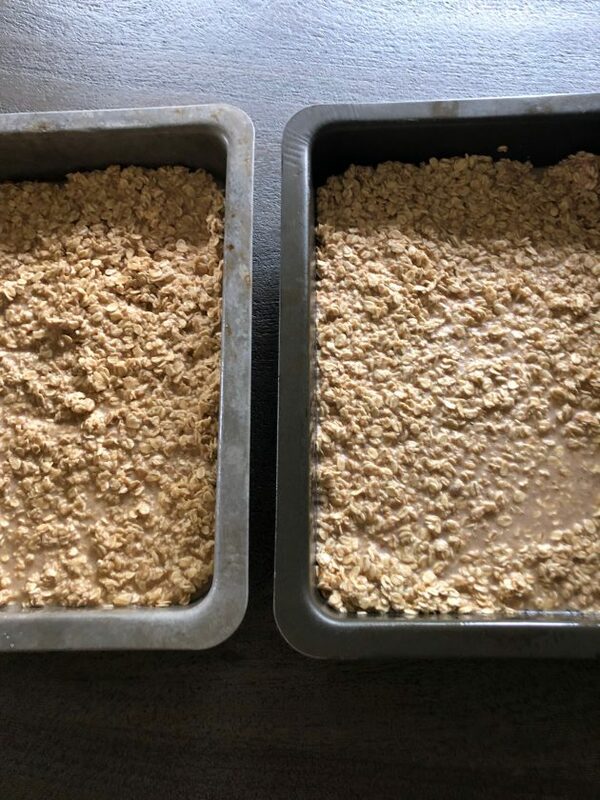 So many of you have asked how you serve Baked Oatmeal. We just scoop it out of the pan into bowls and top it with milk — like cereal. It’s too crumbly to eat like bars but it’s a different consistency than granola or oatmeal. You can dress it up by mixing into different flavors — such as nuts or fruit or dried fruit or chocolate chips. My family loves it plain, but I’d love to hear if you have a fun way to serve it! I’ve also gotten a lot of questions about what kind of oats to use. 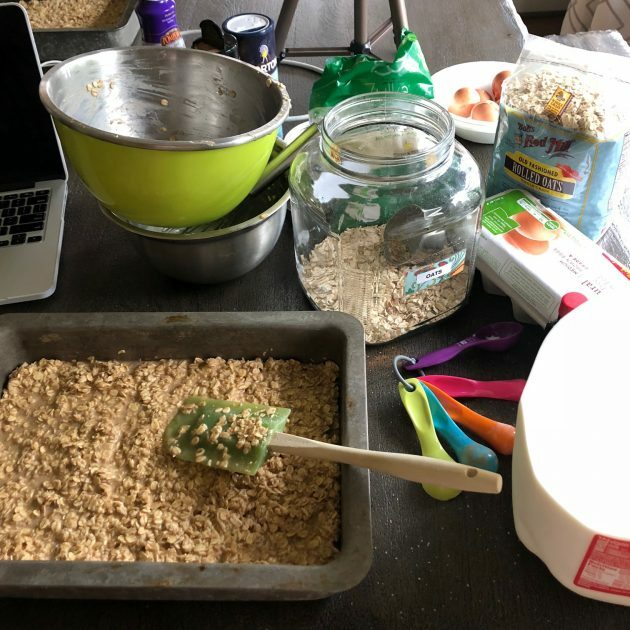 Honestly, you can use any kind of oats you’d like — rolled oats, old-fashioned oats, gluten-free oats, quick oats. They all work! 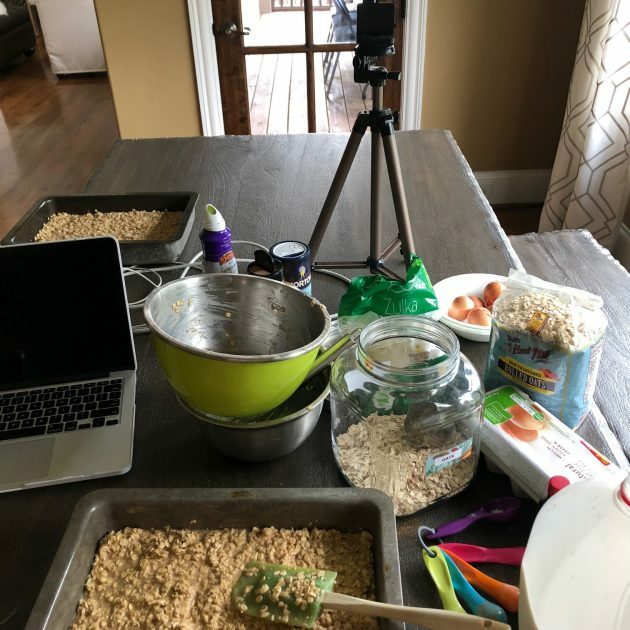 My favorite are rolled oats or old-fashioned oats, but I promise you that any kind of oats will work! So just use what you have! I also bought coconut oil this week since we were out. Only, I totally didn’t get a great deal on it. For some reason, I was messed up on my ounces and was thinking this was going to be a tub twice the size of this one. I bought these specifically because I want to make these Coconut Oil Fat Bombs. Have you tried them before? By the way, I use my Swagbucks credit to earn free Amazon gift cards to use toward purchases like this. It’s pretty easy to earn at least $20 to $25 in free Amazon gift cards every month, just by doing simple activities every day. You don’t need to refer anyone to earn this amount. However, if you have friends who would be interested in earning free gift cards from Swagbucks gift, be sure to use your referral link to invite them so you can earn even more! That said, even though I did use free Amazon gift cards to purchase this coconut oil, I’m still subtracting the amount I “paid” from my $70 Grocery Budget total. The reason is that I want to keep this as relatable and doable as possible for you all. I don’t want anyone to feel frustrated that I can stick with a low grocery budget, but the reason I can is because I’m a blogger and get more referral credit to companies as a result. ? Well, some of you piped in and gave me some great tips on how to use it better. I discovered that you can scan every single one of your receipts and, even if there’s not a participating offer on the receipt, you’ll still get at least 200 or so bonus points (that’s about $0.20). It looks like you can literally scan any receipt — or at least any receipt for groceries! Plus, if you purchase any participating brand, you’ll get points. I thought you had to purchase a certain amount of products for the points to count. But nope, the points count regardless! The other thing I love about Fetch Rewards is that you just scan your receipt. You don’t have to scan any barcodes from products. And if you use coupons, they don’t count those off your point total! Plus, when you scan your receipt, they automatically detect whatever products you purchased that qualified. It’s a lot quicker than Ibotta or Checkout51! So my advice is to go ahead and sign up for it and start scanning your receipts. Even if you only earn a few dollars per month, that’s still something! I’ll continue to test it out and keep you posted! I’m hopeful that I can earn enough from it to “buy” a $5 to $10 Amazon gift card each month that I can use to buy more groceries and stretch my grocery budget a little bit more! Have you signed up for Fetch Rewards yet? If not, you can sign up here and use code WW7XJ and you’ll get a bonus 2,000 points (worth $2). Big Lots has great deals on Coconut Oil and lots of other healthy items!! Thanks so much for that tip! I’m going to try to swing by there next week when I’m in that part of town! I make baked oatmeal every Sunday for breakfast. My prep ahead method had been to mix the dry ingredients in quart Mason jars and then dump it into the wet ingredients when i bake it. My recipe calls for 1/2 cup butter, but I found we can swap out half for applesauce. It’s not as rich, but the flavors go well together. Thank you for sharing your freezer cooking! You’ve been inspiring me to do more prep ahead work. Do you really get at least 200 bonus points for scanning a receipt into Fetch?!? People are saying that it only works for the first weeks. 🙁 And then it goes down to 25 points and there’s a limit of 14 receipts per week, according to what people are saying. I’ll keep using them and keep you posted! My favorite way to eat baked oatmeal is with yogurt and a sliced banana. The first time I ever had it was in Africa – and now I’m reminded of the 4 months I lived there every time I eat it! That’s a bummer! But I guess I’ll enjoy it while it lasts! I try to save all of my app points throughout the year. We use them for Christmas gift buying or gift card gifting. It has saved us many years. I’ve been using Fetch for a while now (back in the beta days) and it is probably my favorite. Like Jennifer said, the 200 only sticks around for a while, but I’ve still cashed out multiple times. I use mine to treat myself to coffee out occasionally. I have had it on my phone for a long time, but it was one of those I didn’t think was worth it, either, until people kept recommending it! What temperature and how long do you bake the oatmeal? I definitely want to give it a try! I order coconut oil on Amazon when it’s a good price with subscribe and save. We go through a lot of it so we buy it in 54 oz or larger. I like Nutiva. Costco also sells it really cheap. I’m hoping to find some great deals on it so we can use it more often, too! We used to use it all the time, but that was back when I had found some GREAT deals on it! My Favorite Way to eat baked oatmeal: Sprinkle on fresh cranberries and chopped walnuts before baking. Company favorite: baked oatmeal topped with cherry pie filling and served with milk or yogurt. We frequently serve this to overnight guests and it is a hit every time. it is also great with apple pie filling or any other flavor really. Strawberry season: Top that baked oatmeal with whipped cream and strawberries. YUM. Possibilities are endless. Oh yes, and I always add LOTS of CINNAMON. If I want to make the oatmeal vegan, can I substitute the eggs for flax eggs or would you recommend something else? I have vegan butter so that’s not a problem but I’m wondering about the eggs. Thanks! Always double check your receipt for missing points after they approve. I’m not sure if this happens to everyone else but I frequently have to correct my receipt and send it back because they forgot to give me points on something. 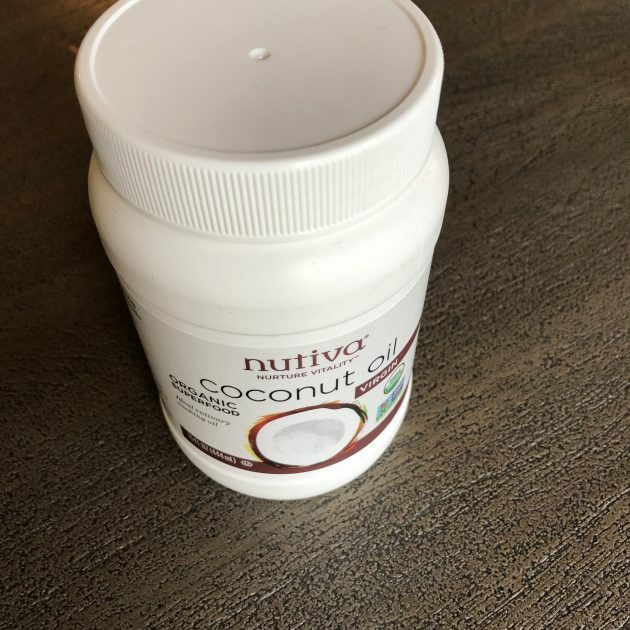 We get our organic coconut oil in gallon jugs from an online Co-Op called Azure Standard – regular price of about $21.45, although right now they’re on sale for $18.23! Azure Standard is a great source for natural and organic bulk products! When you get an account, you actually join a group in your local area, and you can place an order once a month. While you do place your own personal orders online, the group must meet a collective order minimum amount each month in order for everything to ship. Once an order goes through, the group is then assigned a pick-up date and time, and a refrigerated truck arrives at a predesignated location in your area for everyone to come pick up their items. Thanks so much for sharing! I’ve ordered from Azure before when we lived in KS, but I always split an order with a friend! I need to find a friend here in TN who would like to split an order with me since there are only a handful of items that I find to be really great prices (compared to the prices I can get elsewhere) that we regularly use. Thanks for mentioning this as I’ve been thinking of trying to figure out a way to make Azure work for me again here! Not sure if you have a Costco… Kirkland Signature Organic Virgin Coconut Oil (cold pressed, unrefined) 84 fl oz for about $18, so about $0.21/oz. Although, might be hard to buy that much in bulk, with you current weekly budget. When I was doing something similar, I’d always hate being out of a $20 single ingredient, like dog food. Thanks for the Costco tip! Definitely Aldi for the coconut oil. They have the organic kind and it is around $4. I don’t know why I was thinking to try Amazon. Oh well! Live and learn, right? Dollar Tree sells coconut oil in many locations. It’s not organic, but it is a cheaper option for folks that don’t mind that. Sam’s Club is cheapest I found for coconut oil! About $14 for a 54 oz tub! And it’s good too! Whoa! That is a great deal! I often get my coconut oil at Krogers especially when they send you loyalty q’s. As for Fetch.. I don’t often get stuff on their list, but it’s so easy to get points. Why not? I may have only got about $5 stacked up so far.. But it’s $5 more than I had before. Maybe a stocking stuffer for a family member. I’m waiting to cash in on many of my points I have stored in various accounts. If I don’t cash in on it.. I can’t spend it. Saving it for Christmas. I don’t know if you have a Sam’s club membership but I get an organic 54 oz container for a little more than $15. We loved baked oatmeal. I use this recipe but I use frozen blueberries and strawberries http://www.sohowsittaste.com/2012/06/blueberry-raspberry-baked-oatmeal.html. I’ve added Receipt Hog to my coupon/cashback apps since I read this post from Dave Ramsey. I’ve not had it long, but I take pics of receipts and upload them. I’ve done surveys and they have something called Hog Slots that will add coins/points to your Rewards account too. Last I had heard, Receipt Hog wasn’t letting anyone new sign up for their program? Has that changed? I wasn’t aware of that. I signed up 3/24/18. I’m not sure about that. I signed up in March 2018. I like Fetch Rewards for the sole reason I get points for MtDew. It is non negotiable with my husband so I look for sales and ways to get mney back.